57 leading food writers from 45 countries. Dinner is served on Friday and Saturday evenings - with reservations available from 6pm to 8pm. Dinner reservations are accepted up to three months in advance. We can accommodate parties up to 10 guests. We do not sell alcohol, but you are welcome to bring your own wine. Corkage fee: $10/bottle. We are a small operation, so when reservations are cancelled at the last minute, we’ve already started sourcing, purchasing, and preparing for you by that time. For this reason, we have a strict 72-hour cancellation. Our menu changes frequently, reflecting the seasons and availability of the freshest ingredients, some sourced right off the property and others from trusted purveyors of sustainable, responsibly raised ingredients. Due to our size, we do not have the resources to tailor individual dining preferences and do not generally offer menu substitutions. We hope to introduce guests to new experiences. We will do our best to accommodate for food allergies and vegetarians. If you have further questions, please give us a call. A modern, five-room, boutique inn. Each room features high ceilings and large sliding glass doors to take in views of the rolling terrain. Revel in the quiet, the rich air, and the sky brimming with stars - or, occasionally, the grand theatrics of a West Texas thunderstorm. Sip your morning espresso and start your day in the outdoor common area. Travel the grounds on foot, passing by vineyards in progress, then return to revive and relax in the pool. No smoking indoors. Unfortunately, we cannot accommodate pets. Cancellations must be made with 14 days notice, or full room rate will be charged unless room is rebooked. The four queen rooms offer a light-filled cozy place to stay. 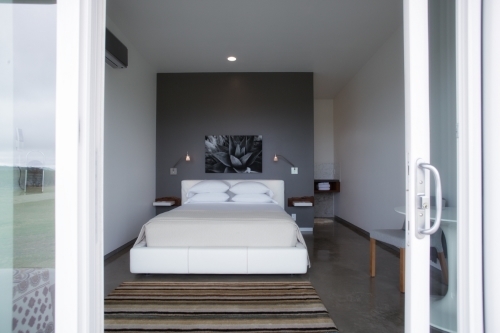 Each room has large walk-in, tiled shower and individual climate control. The spacious king room offers a secluded place to rest. There is a freestanding soaking tub as well as a private outdoor shower. While his favorite dish may change depending on what he is eating in the moment, Robert is always passionate about sharing authentic food and life experiences with guests. Before setting his eyes on the RANCHOLOMA hills, Robert's views of the world ranged from the back of a bull (as a rider) to looking through the lens on a film set (as a director). His prefers a cocktail of Milagro silver tequila, fingerlimes, and smoked sea salt - which, at his ideal table, would accompany a leisurely dinner with Edward Zwick, Quanah Parker, and Keith Carter. Before discovering her affinity for orchestrating meals using the most flavorful ingredients, Laurie applied the same eye for quality to her career as a commercial film producer. She takes particular pleasure in persuading people to eat (and enjoy!) their beets. While Laurie has never eaten at McDonalds, her first food industry job was maitre d' of the Sonic parking lot. Given the choice of an ideal cocktail and table for four, Laurie would sip on Hendricks gin, cucumber, juniper berries, and Topo Chico while sharing food and stories with Eddie Vedder, Rene Redzepi, and Joel Kinnamon. We are throwing a dinner party every weekend in our home - we want you to come experience the flavors and overall experience. We hope you will slow down and enjoy the company and conversations with others. We cook the food we love in hopes that you will love it, too.